The new C.S. Mott Children's Hospital and Von Voigtlander Women's Hospital in Ann Arbor opens on Dec. 4, 2011. Robert Kelch recalls when the first C.S. Mott Children’s Hospital opened in 1969. Then in his residency program after medical school, Kelch says there was an undeniable atmosphere of excitement surrounding the move into the $6.5 million facility. It was modern in every way. Wards were organized by sickness, a practical layout helped reduce the spread of infection and, Kelch said, a room lined with 20 bassinettes was specifically dedicated to sick newborns. But as breathtaking as that facility was, Kelch said it doesn’t compare to the new University of Michigan C.S. Mott Children’s Hospital and Von Voigtlander Women’s Hospital, which is set to open Dec. 4. 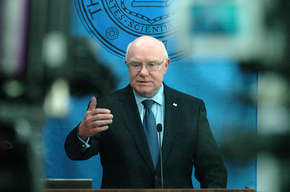 “That was a wonderful event back in 1969 but this dwarfs that event immensely, this is just a greater stride forward,” said Kelch, who presided over much of Mott’s construction during his time as the CEO of the University of Michigan Health System from 2003 until 2009. In the new $754 million, 1.1 million-square-foot facility every hospitalized child will have his or her own room. Sick infants will also have individual rooms. Single occupancy inpatient rooms drastically decrease the risk of infection and are believed to lead to better outcomes for sick children because they provide comfortable atmosphere. Former University of Michigan Health System CEO Robert Kelch. The new facility makes one thing clear: What was once state-of-the-art is now old news. For example, the floor-to-ceiling height of the old Mott building wasn’t large enough to fit the latest MRI system. The new hospital, located at East Medical Center Drive where an old surface parking lot used to be, spans the length of two football fields. It increases capacity from the current level of 200 beds to 348. 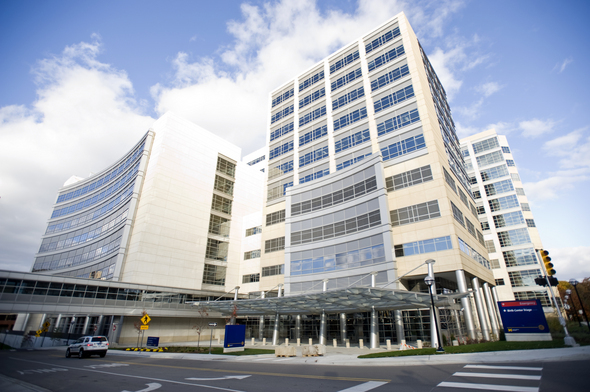 The 75 percent increase makes Mott the largest of Michigan’s three children’s hospitals. It includes a nine-story outpatient wing, a 12-story inpatient wing, 16 operating rooms and two radiology rooms. Each inpatient room is single occupancy, following an industry-wide trend that most renovated children’s hospitals are “striving toward,” said Larry McAndrews, CEO of the National Association of Children’s Hospitals and Related Institutions. Warner said that while Mott generally receives positive feedback from patients, one of the most prevalent complaints was related to patient comfort and cramped rooms. Most rooms at the old Mott facility are double occupancy. The new C.S. 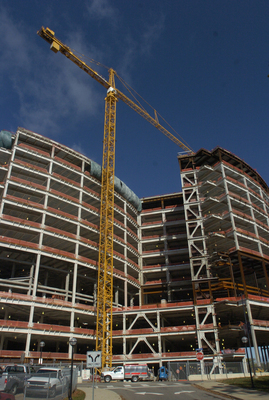 Mott Children's Hospital during construction. If you don't account for inflation, the new hospital is 116 times more expensive then its predecessor. It also constitutes the biggest price tag in university history and is one of the most expensive construction projects in the history of the state. Of the $754 million project, U-M financed $588 million through tax-exempt bonds, $91 million through cash reserves stockpiled from hospital operations and $75 million through fundraising. When the project was first proposed in 2005, U-M planned to finance approximately $150 million through debt. At that time, the bulk of funding was scheduled to come from cash reserves. Currently, the health system has $1.8 billion in reserves. “Because we funded this project with debt, we funded many of our others with our capital reserves,” she continued. The hospital system recently switched to a new multimillion-dollar communications system, a change that was solely covered by reserve funds. In the past ten years, the health system has invested $2 billion in improvements and Damschroder expects another $2.5 to $3 billion to be invested in the next decade. The $588 million debt has a payment schedule of 30 years with an interest rate that ranges from 2 percent to 4 percent. Fundraising — including numerous efforts by Michigan sports coaches and former athletes — covered approximately 10 percent of the total Mott cost. The Flint-based Charles Stewart Mott Foundation offered the single largest donation at $25 million. Nevertheless, patients and insurance companies are already paying for Mott. 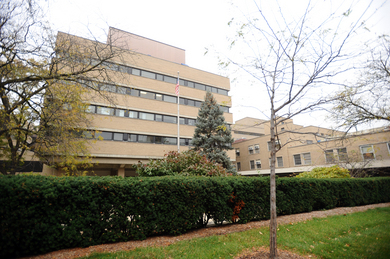 In fiscal 2011, charges at Mott and Women's hospitals went up 4 percent —compared to an average yearly increase between 3 and 4 percent. The average cost per case at the Mott and Women’s was $21,830. The new C.S. 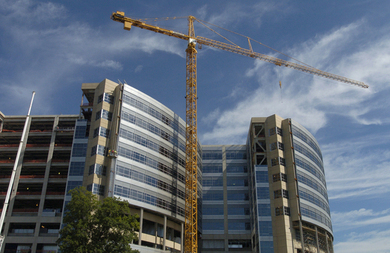 Mott Children's and Women's Hospital rises beside a towering construction crane in Ann Arbor. Increased demand for University of Michigan medical services has forced a change in construction plans. The children's and women's hospitals currently account for 20 percent of the health system's $2 billion in revenue. That percentage is expected to rise. During the 2012 fiscal year, though, the U-M Health System has projected a $23.5 million loss — in part because of the new hospitals. Start-up costs for the new facility are expected to reach $70 million during its first year. But over time the new hospitals are expected to boost the U-M Health System's financial position. Warner said Mott and other health system hospitals will be looking to trim expenses to accommodate. “Our challenge now is, because we’re putting on this new expense, how do we make sure we operate in the most efficient way possible,” Warner said. The projected rise in revenue is tied directly to 75 percent increase in beds, compared to the current building. “We have been a bit capacity-constrained as we’ve waited for the new facility to open, so we do expect to have a rise in activity which would then correlate to an increase in revenues,” Damschroder said. Kelch put it more bluntly: "We were turning patients away," he said. As hospital officials began brainstorming ideas for the new facility in 2004, they made one critical decision that would guide the process. “One of our operating principles is that we would design this facility from the patient perspective to the maximum degree possible,” Warner said. About 450 staff, patients, family members and volunteers participated in work sessions and provided input on the new hospital, giving insight on colors and designs that would put patients at ease. Due to patient feedback, the new building's walls are painted in bright, warm colors and decorated with more than 1,000 tiles of patient-created artwork. “The idea is to make kids feel at ease and at home when they come into the hospital, which could otherwise be scary,” said McAndrews. More than ever, attention is being paid to windows, light and color. At Mott, that means sweeping views of the Nichols Arboretum. Hospital officials also toured over a dozen hospitals when deciding what to prioritize in the new facility. It was on one of those tours that U-M decided Mott’s neonatal intensive care unit would also include private rooms, an issue that had been in debate. U-M has created approximately 500 new jobs at the new facility, which officials anticipate will attract top-flight physicians and researchers. “Whenever we open a state-of-the-art facility like this one, we’re also helping the state of Michigan attract and retain top talent from a physician and nurse perspective,” said Brian Peters, executive vice president of operations of the Michigan Health and Hospital Association. Warner agreed, saying that a modern facility could also attract a wider swath of patients. Peters said that new facilities are tied to better performing hospitals. “We always see that employee satisfaction rates are typically higher because you’re working a beautiful new facility, and happy workers tend to deliver good results,” he said. The five-year construction process also provided jobs for more than 1,200 workers even as Michigan economy contracted. The 500 new staff —including 370 who have already been hired— will be essential in the move to the new facility, which is scheduled to take just 12 hours. For nearly twoyears, Warner and her crew of 6,000 have been preparing for the transfer of approximately 200 patients —many of whom are in critical condition. From 7 a.m. to 7 p.m. Dec. 4, patients will either walk or be moved down an 800-foot indoor hallway that links the old hospital to the new one. The hospital has doubled up on most of its standard supplies so that both old and new Mott hospitals will be fully stocked and operational during the move. A 24-member patient move steering committee, which includes volunteers, nurses, doctors, administrators and the family members of those at the hospital, has “planned for every possible contingency,” Warner said. Sun, Oct 30, 2011 : 9:24 p.m.
Sun, Oct 30, 2011 : 6:13 p.m.
As a family who spent much of our child's short but precious life at Mott, we are grateful that families will have a better enviornment for their sick and dying children. Unless you have spent week after week, month after month in that old hospital, you won't have a clue as to how it is needed. Only good things will come from this change. Sun, Oct 30, 2011 : 5:10 p.m.
Sun, Oct 30, 2011 : 2:53 p.m.
As far as the taxes comment, most health systems are aligned with religion, universities or government; very few pay any taxes. If you want taxes, tax the people that work there. While I'm not a gung ho U-M lover as I feel they stretch their education &quot;mission&quot; in many ways, I recognize that without U-M Ann Arbor would not have the jobs, amenities and maintain the property values that it does. If you don't like U-M, there are plenty of other places to live. As far as healthcare, I am very happy to be 10 minutes from a nationally recognized powerhouse as I had to utilize their skills this year when my daughter was in the NICU. Sun, Oct 30, 2011 : 2:19 p.m. Outstanding accomplishments by all those involved = U of M hospitals leadership, physicians, nurses, therapists, food service workers, custodians - really everyone involved, I hope, feels really, really good. Wish you continued success in your fine mission of bringing the best healthcare in the world to those in need. Thanks for your hard work, dedication and taking care of sick patients and their families - really nice job! Sun, Oct 30, 2011 : 1:58 p.m. There always has to be someone with a negative comment. Forget about all of the good this new facility can do. If it wasn't for U of M there wouldn't be an Ann Arbor. Sun, Oct 30, 2011 : 10:55 a.m. Think of all the taxes it WON'T pay. Mon, Oct 31, 2011 : 9:14 p.m. Think of all the revenue from the employees, families and visitors that will go into the local economy. Unfortunately too many people in Ann Arbor only look at the fact that U of M pays no property tax. People forget about all the positive benefits that having U of M brings to a city like Ann Arbor. Stop for a moment and think about what Ann Arbor would be without U of M. Remove all the jobs provided by U of M, remove all the students who come to U of M to school, remove all the patients and their families from the hospital and what do you have - a very small town. When you consider all the revenue to all the local businesses that provide goods and services to the university, it's employees, students and patients U of M makes a significant contribution to this community. It would be interesting to have a study done of Ann Arbor and the impact if there was no U of M. I don't think believe it would be a very positive report. Mon, Oct 31, 2011 : 12:43 p.m. Seriously? You've obviously never sat next to a hospital bed with a precious child suffering from a terminal illness. I have. This new hospital building has been a long time coming. The doctors, nurses, and staff who care for sick children deserve to have the best facilities, technology, and equipment. So do the children and their families. Sun, Oct 30, 2011 : 4:16 p.m.
Sun, Oct 30, 2011 : 12:50 p.m.
And think of all the lives and families it will save. The benefits far outweigh the 'loss' of a few tax dollars.